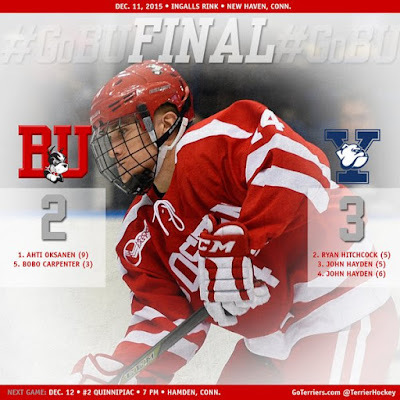 #11/12 Terriers began their weekend in Connecticut by dropping a 3-2 decision to #15 Yale at Ingalls Rink. The score was the reverse of the team’s last meeting last March in the NCAA regionals, when BU won in overtime on a Danny O’Regan goal. BU nearly took a lead at the end of an evenly played first period when Ryan Cloonan fed O’Regan on a two-on-one rush, but this time Yale’s Alex Lyon kept the game scoreless. Seven minutes into the middle period, BU took a lead when Jordan Greenway (photo) controlled the puck behind the Elis’ net and found Ahti Oksanen in the slot for a one-timer. Following that score, however, Yale’s forechecking and increased offensive pressure changed the momentum as they outshot BU 18-10 for the period. A key turning point came with less than three minutes left when Yale won an offensive zone draw and put a shot from the blueline on goal. Connor LaCouvee made the initial save, but an unmarked Ryan Hitchcock buried the rebound. Less than a minute later, Cloonan took a major boarding penalty—“ a stupid penalty,” according to Coach David Quinn—which also resulted in a game misconduct. Yale quickly converted when passes deep in the BU end freed John Hayden for a one-timer from the circle to LaCouvee’s left. The Terriers killed off the rest of the major penalty allowing just three more shots, regaining the momentum. Then, six and a half minutes into the final period, a 3-on-2 Yale rush, not played well by the BU defense, allowed Hayden to go in alone and beat LaCouvee for a two-goal lead. A familiar script saw BU seeking to rally in the third. BU outshot their hosts, 10-3, and finally connected on a power play with 2:42 remaining when Charlie McAvoy’s cross-ice pass set up Bobo Carpenter for a one-timer from the circle to Lyon’s left. That, however, was the extent of the Terrier rally. ► LaCouvee turned aside 28 of 31 shots. Greenway, who continues to impress, earned third-star honors. ► Among the former Terriers in the crowd were All-Americans Chris Drury and Mike Pomichter and former associate head coach Steve Greeley. ►The Terriers will travel eight miles to Hamden for a meeting with #2 Quinnipiac tonight.